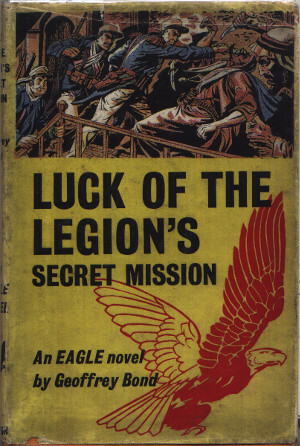 Luck of the Legion's Secret Mission. In search of a missing wooden hand - a treasured relic of the French Foreign Legion - Sergeant 'Tough' Luck is on a mission for its recovery. Kidnap, Aztec treasure and more await the trio of companions Luck, Trenet and Bimberg. Just when you think you know where the story is heading, another twist in the story appears. Dimensions : 13.5cm x 20cm with 160 pages. "Cease! Bladder of lard that you are!" "For that's what I'm called, you know," he added confidentially; "François the Mad One!" "Thunder and lightning" "Sapristi!" "Ishkabibble!" Imagination seemed fact, and fact imagination. If one thought monsters, one could believe monsters. "Well, as long as they don't want to eat us, it's something!" "Yatter, prattle, nag and bind!" grumbled Bimberg, perspiring as he sawed away. "But first let us find the treasures, little brothers of the cockroach!" "Much as I like food I do not yet want to become either a hot steak or a cold chop!" "So you might call it a mission within a mission. A secret mission, in fact!"